grilling and smoking oh yeah! – RV Cheaper! April 18, 2017 April 18, 2017 RV Cheaper! grilling and smoking oh yeah! 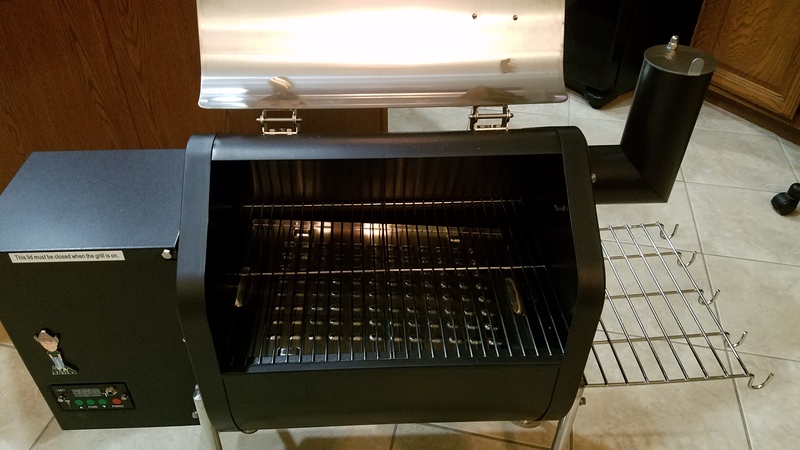 I have a passion for smoking meats and grilling in general and I’ve got an awesome grill for at home. But I’ve tried three portable grills for our various RV’s that were really frustrating to use because of uneven temps. Those grills ended up in yard sales or the recycle bin over the years. I’ve shopped around and came close to pulling the trigger on the Coleman Roadtrip, Vector and a few others. Now that I’m looking at long RV trips and possibly full time RV life someday, I started thinking about finding a portable smoker. The smoker I used at home would be super bulky and messy to haul around. I’ve used my Brinkman H2O so much over the last few years that I rusted it into pieces (an H2O Smoker steams and smokes). I started looking at building a smoker using large air or propane tanks, my brother inlaw John (triglideseniors.com) gave me two tanks when he sold his shop. Without 220 volt outlets and cutting/welding equipment I’ve never gotten that project off the ground but I’m still hoping to make one for the home base some day. Over-thinking as I always do, I started pondering the combination of grilling and smoking, I found out that pellet smokers are great at it. I wasn’t too sure about pellets after seeing the glue based pellets my Dad’s home heating stove used. I found out cooking pellets use all natural binding, no glues. Then our Happy Hour friend Chris got a Green Mountain pellet smoker and after trying what he’s made, I was instantly ready to dump the wood/charcoal fuss! 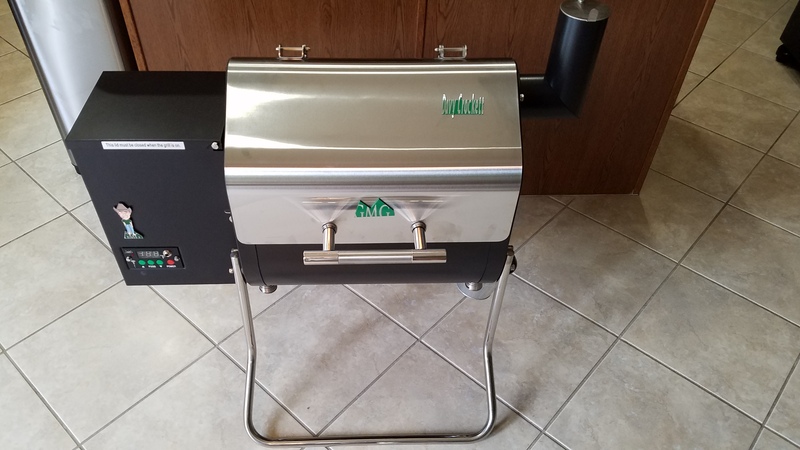 So I continued to over-think a while longer and when I finally got around to checking out the various brands of pellet grills I found some portable models. I did a ton of comparison on the portables trying to see if they might work out for home and the RV. I learned that Green Mountain has a portable grill/smoker that runs on 12 volt or 110 volt house current. I was worried about the 12 volt model not performing, but came to find out Green Mountain has incredibly accurate and even temperature control. The Green Mountain models can all be controlled with a smart phone up from anywhere via a home router. I was sold! Green Mountain uses digital temperature control instead of a dial like most brands. The smart phone app let’s you set up a cooking profile for each type of meat and comes with several preset profiles. What’s really awesome about the cooking profiles is the endless combinations of cooking time, cooking temperature and internal meat temperatures you can use use as triggers for the next step of cooking or to finish the profile. Once the food is done you can shut off the grill or have it hold the food at 150 degrees (perfect holding temp). The app is super easy to use right away. The pulled pork profile browns and smokes at 385 for 30 minutes, then drops to 215 until internal temp hits 193, that made an awesome smoke ring! Once meat temp was 193 it switched to keep warm at 150 degrees. The 150 degree keep warm option at the end is priceless! Stainless grates are so much easier to clean! The unit folds up small enough to go into one of the RV’s basement compartments. 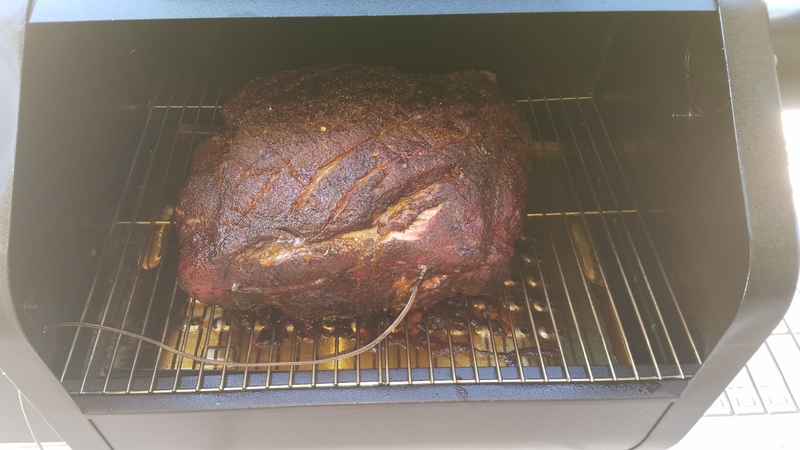 This was the longest time I’ve ever smoked Pulled Pork and didn’t over cook it! The temp was so steady it smoked for 21 hours and held a narrow 215-225 degrees until internal meat temp hit 193. I only used about 6 pounds of pellets during that 21 hours! Two weeks later Sams Club had my model on sale for $299 and they threw in two bags of pellets! I was kinda bummed thinking I was a chump of a shopper but I managed to console myself buying more meat! After about 30 pounds of meat I finally went through my first bag of pellets, I’m amazed how many hours I can get out of those pellets. I’ll never go back to charcoal but I still do want to build that home made smoker some day and I’ll use good woods in that. So if you would like to grill and smoke on the road, the Davy Crockett is worth considering, just shop prices better than I did if you want to save a bunch of money. All of the removable parts must be cleaned each time, being stainless they clean up nicely in the dishwasher without messing it up. The main unit is seasoned nice & thick so cleaning the grates, two drip pans and fat drain bucket won’t short change you on great smoke rings. There’s a layer of smoke that won’t scrub off, so I’m surprised it doesn’t keep getting thicker even with washing each time. To control from anywhere, you must connect the Grill/Smoker to your home network. The grill must be within about 30 feet of your Router to manage a batch remotely, that’s tough with a smoker outside. I’ve gotten away with 40 feet through walls yet lost the connection only 20 feet away through a window. I’ve gone back to Point to Point mode and connecting the phone directly to the Green Mountain Grill (GMG). It’s just so much easier to set it and forget it until it’s done. I’ve found no benefit in checking temps from Home Depot or the auto parts store, you don’t need to open a smoker, you don’t need to babysit the GMG! Once you start a profile (recipe) the GMG will finish it out automatically to the end with perfection but, you must use the same tablet or smartphone if you insist on checking temps and recipe progress until that batch of food is done. The Smartphone/Tablet app is really easy to use, but it seems like every time I turn on the device, it’s dings with the most recent status of the grill. I should report it as I’m sure they would fix it in an upcoming patch. I’m handy with computers and networking, but I’ve had a couple stumbles on the wifi connections and firmware updates. I thought I blew it a couple times but customer support came to the rescue and was ready to send me a new computer for my grill a couple times until I found out I made a blunder that was easy to fix.